We moved a funny old home-made brick urn into a flower bed and filled it with water, to match a similar one that we use as a bird bath. We’ve not seen many birds, but it is in full use. 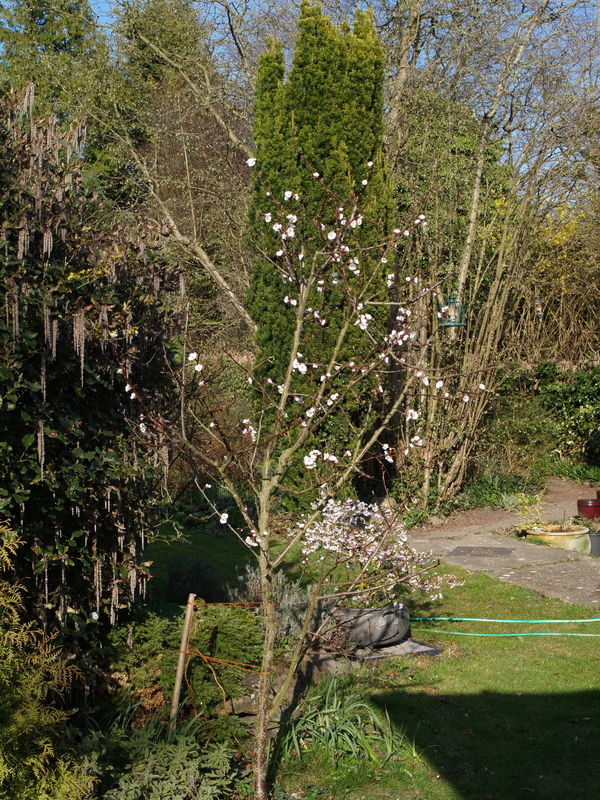 In January 2009 I succumbed to an offer – a so-called Garden Bargain mini Orchard. 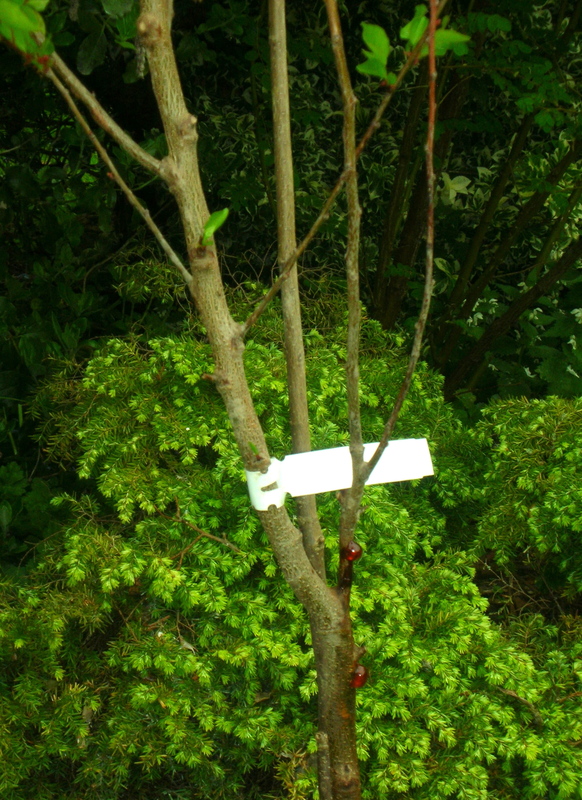 I received three bare-rooted named fruit trees: a Moorpark apricot, a Victoria plum and a Sunburst cherry – all guaranteed to flower and fruit in the first year. I planted all three, but was concerned about the resin oozing from a wound on the apricot – I was told to report back again later in the year. Neither the cherry nor the apricot flowered in year one. The plum flowered; it looked remarkably like an apple, but as a late frost wiped out the blooms, I couldn’t prove it. The apricot continued to weep, but I had to agree that it was still alive. Year two, still no flowers on the cherry or the apricot. The plum was definitely an apple, but the fruit fell in a late frost before I had photographed it. The apricot was still alive and its wound beginning to heal. I stopped making any attempt to contact the vendors. Year three – nothing. We moved the apple and bought a Victoria plum. Year four – March 2012. The not-plum apple flowered well and set fruit, the new real plum flowered, but did not set fruit. The cherry had a couple of blooms, but no fruit. The apricot flowered, looked stunning, and set some fruit. Late frosts again wiped out all fruit. 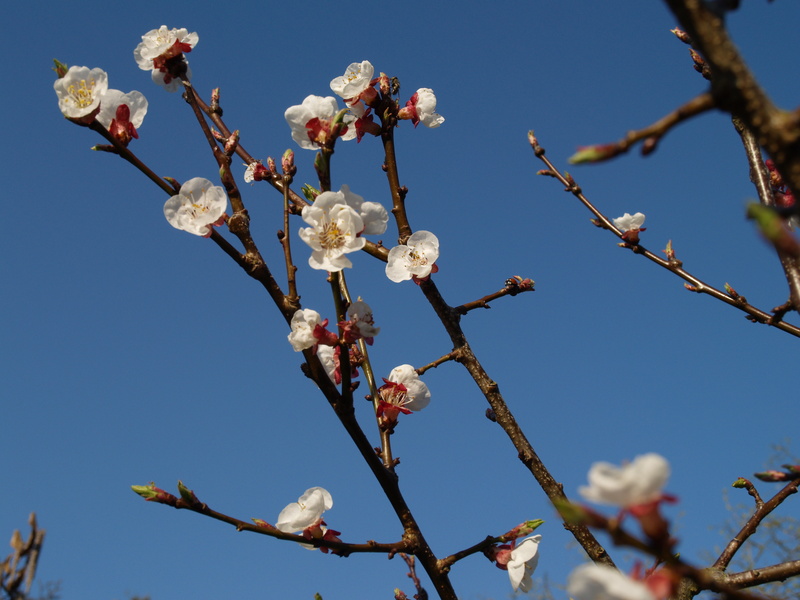 Year five – three blooms on the apricot and no fruit. The new plum, the not-plum apple, and the cherry flowered and have growing fruit. I can’t wait. I have no idea what kind of apple the ‘plum’ will turn out to be. This entry was posted in Gardens and tagged bees, Moorpark apricot, Sunburst cherry, Victoria plum by hilarycustancegreen. Bookmark the permalink.